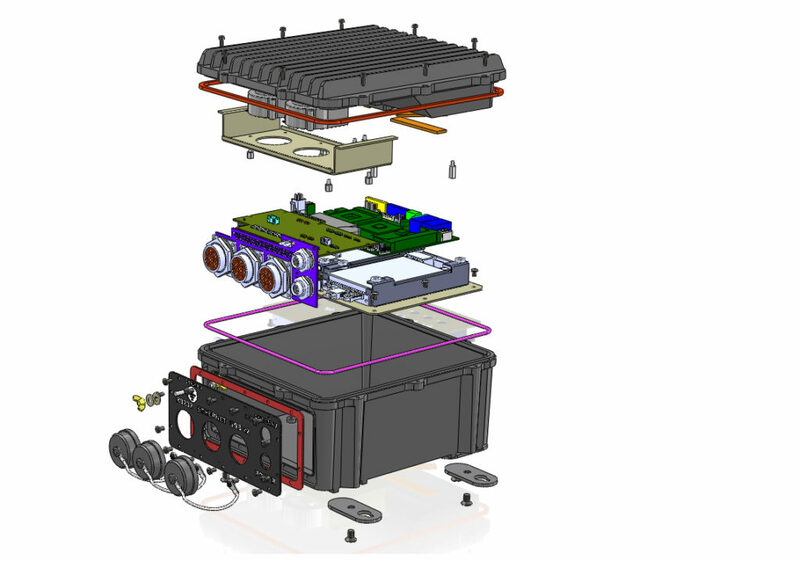 When you want the most in storage and data acquisition, the AGS-NetPAC has your back with 16 removable 2.5″ drive bays. This system has the RAID controllers and gigabit ports to handle the most demanding workloads. 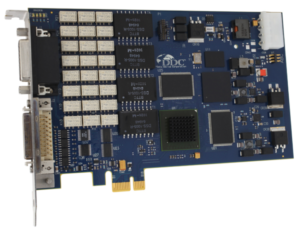 With Samsungs fabled 30TB 2.5″ SSD (that’s not for sale), the AGS-NetPAC could storage 480TB. Set a reminder to look at this article in 5 years when there are 500TB SSDs. 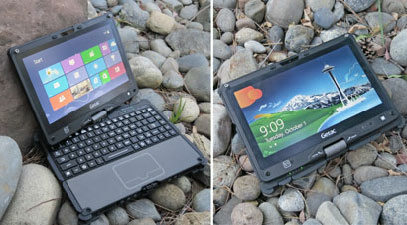 Getting back to reality, the AGS-MRPC is the sensible, entry level approach to portable computers that covers a broad range of applications. The micro-ATX motherboard’s 4x PCI slots and the chassis’ 2x 5.25″ external bays enable customization for military connectors, communication ports, and proprietary cards. Let’s see how much storage we can obtain if we forget budget, wiring and we dedicated every port, slot, and screw to storage. 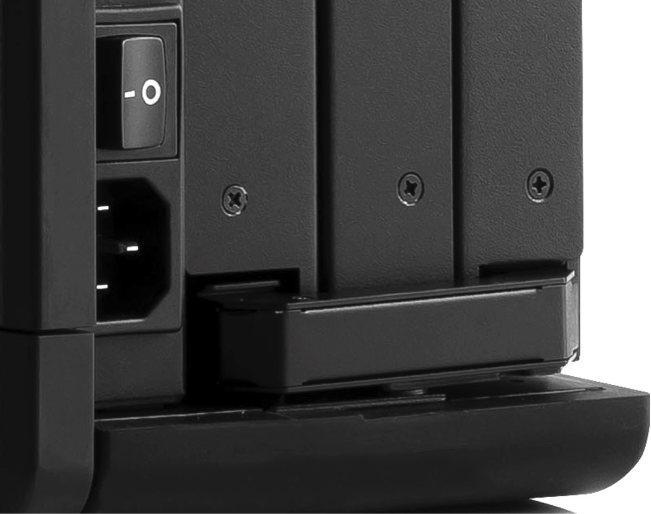 The external 5.25″ bays can be converted to 4x 2.5″ removable drive bays. Along with the internal slot, that’s 9x 2.5″ drives. The largest commercially available 2.5″ SSD is 4TB. Subtotal 36TB. All 4x PCIe slots can fit 800GB PCIe x4 SSDs. Subtotal 3.2TB. Many motherboards have a single M.2 slot. 2TB is the best available at this time. Subtotal 2TB. If you have a configuration you’d like to explore with us, let us know in the comments or send us a request. The PCG Tempest X500 is a rendition of the Getac X500 rugged laptop that is retrofitted to reduce electromagnetic emanations to meet TEMPEST standards. This product and solution includes a multitude of circuit-level and hardware-level retrofits to reduce EMI throughout the laptop, including custom doors, EMI screen, silencing of bluetooth, silencing of GPS, and more. Tempest is a specification defined by the NSA, defined for protection against information systems security leaks through electrical emulation, radio or electrical signals, and sound. Meeting this specification is often a requirement for highly classified applications, including field-deployed military applications. This product and service, along with wither customized ruggedization services, is available through the ProCustom group. 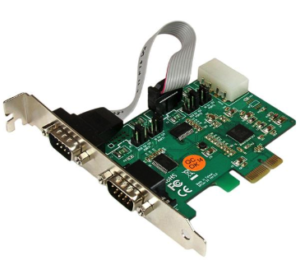 Graphics cards are an expensive yet essential component in any computer. 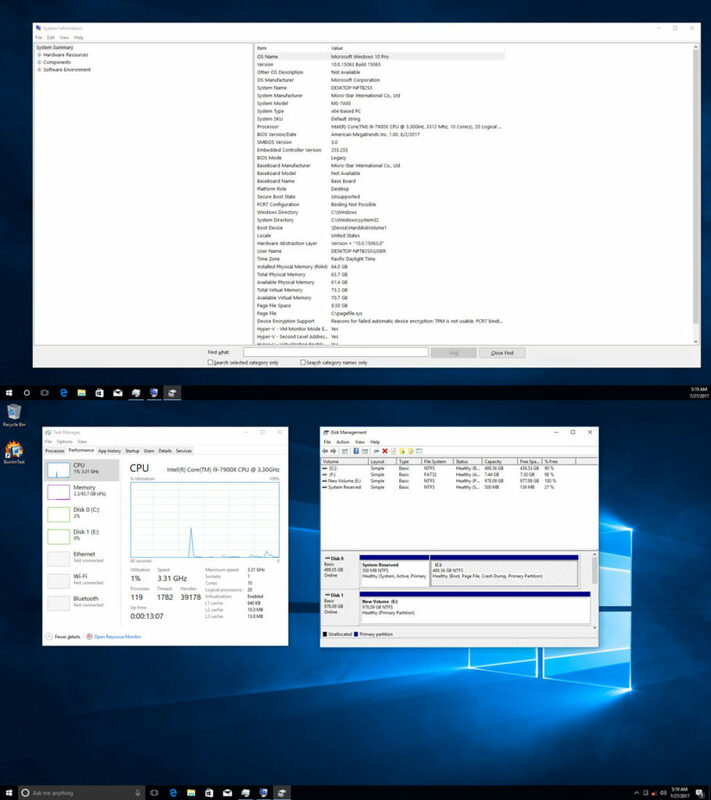 The graphical processing unit (GPU) off loads computationally taxing rendering tasks from the CPU. With the explosion crypto currency, crypto miners have harnessed the power of the GPU to turn clock cycles into crypto currency while driving up the price of graphics cards to record highs. The cost of a rugged portable computer moderately increases with GPU price increase because a graphics card is just a single component in most rugged portable computers, unless you have a whole world to see with multiple displays. 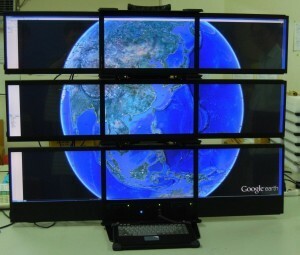 The above pictures shows 1 AGS-MCCS-3U and 2 AGS-MCCD-3U stacked with mounting hardware to create a 9 monitor system with 5760 x 3240 resolution. The AGS-MCCS-3U has 3 17.3″ displays totaling 5760 x 1080 resolution and can be customized to meet a wide variety of needs within an ATX motherboard form factor. The AGS-MCCD-3U has the same display resolution without the computer. A standalone AGS-MCCD-3U has a DVI-D, VGA, and DisplayPort port for each display and 3 x 6′ DVI-D cables are included. An additional graphics card is recommended to drive the 3 displays. If your system does not have space for a full sized graphics card nor the required ports (i.e. a laptop), the USB upgrade for the AGS-MCCD-3U has a single USB 3.0 input to control all 3 displays. Since 2015 the MilPAC-III has been a powerhouse portable serving the US Navy as part of their C4ISR suite in the combat information center. Now the MILPAC-III 1000-nit display upgrade lets the MILPAC-III come out of the darkened environment of the CIC and into the direct sun without losing display clarity or readability. With new 1000-nit hi-resolution FHD displays that are clearly readable in direct and diffused sunlight, the MILPAC-III can be deployed forward in harsh desert environments that call for extraordinary display capability. Nominally specified at 1000-nit brightness, the new displays have a contrast ratio in excess of 400:1 while providing deep blacks and extremely bright and readable detail. 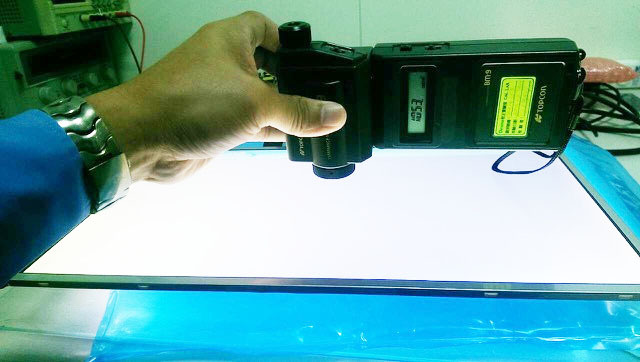 The 1000-nit displays were tested for maximum brightness and uniformity using a Topcon BM-9 Luminance Meter: Measured maximum white luminance was 1053 nits. 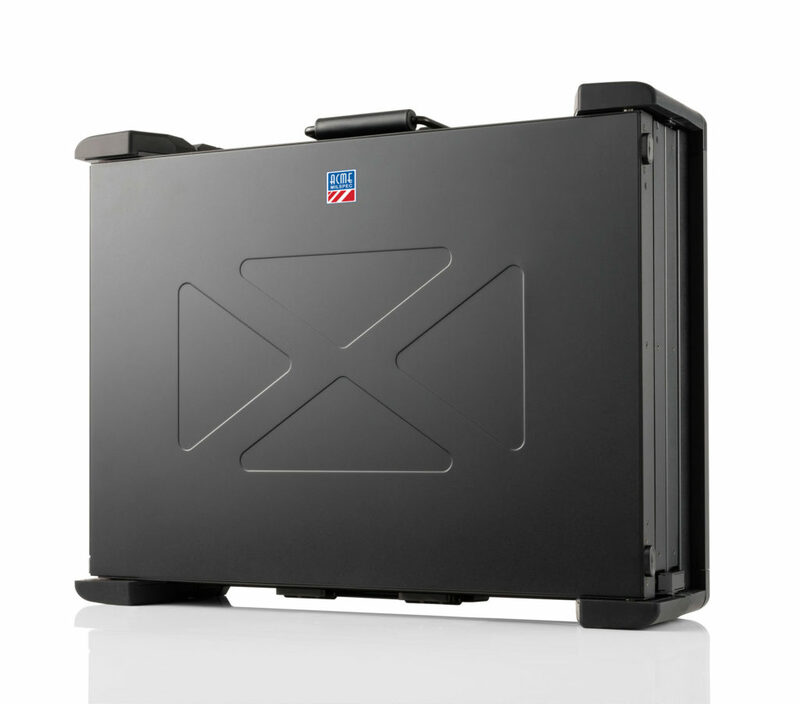 The MilPAC-III deployable workstation’s is available with a high-capacity filtered cooling system, the DFB (Desert Filter Back). Utilizing a washable electrostatic filter and four high performance fans, the high airflow cooling system allows extended operation in hot, dusty and unpleasant environments. 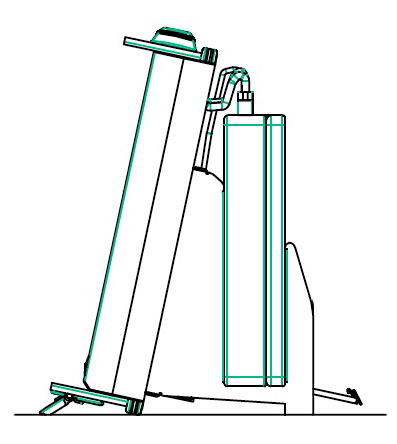 The positive pressure system ensures that contaminants are stopped the filter. 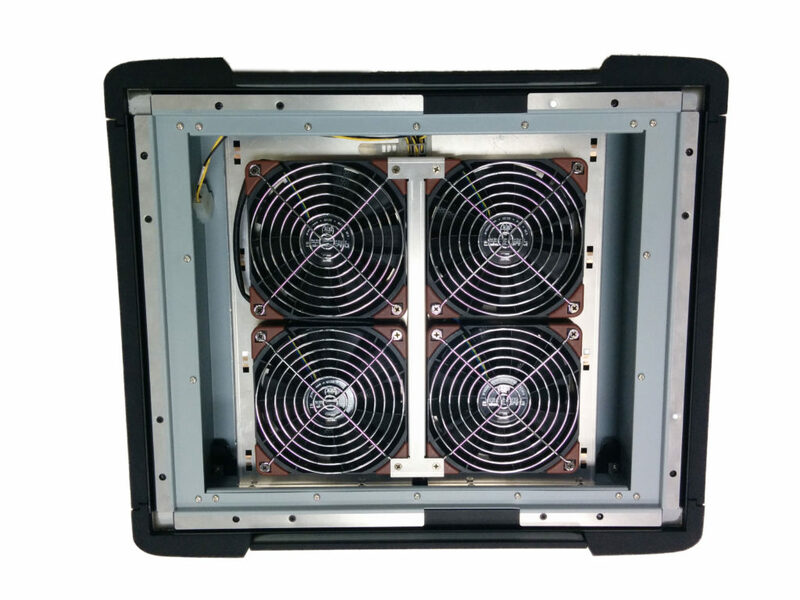 The four fans were selected and tested to perform well as a high-pressure input to the cooling flow. All air entering the MilPAC-III is filtered through the filter-back, and all the other fans exhaust, keeping the interior clean and cool. 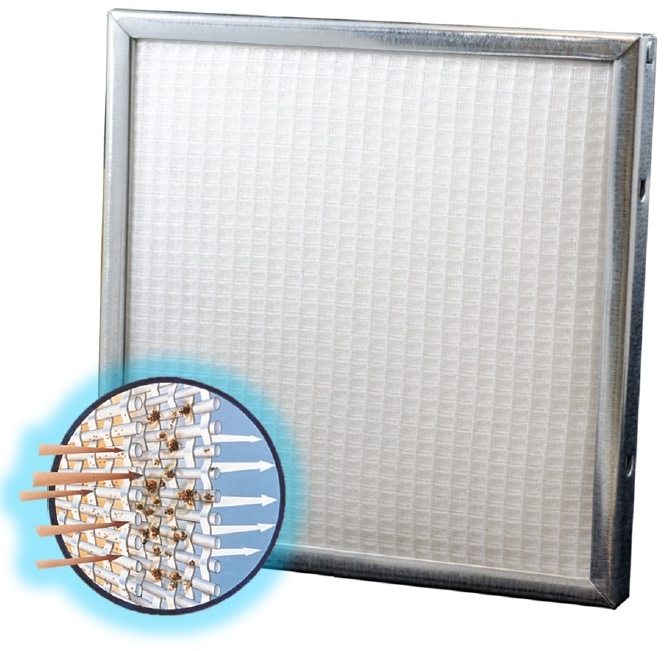 The MilPAC-III filter is constructed of multiple layers of custom woven electrostatic polypropylene media, plus non-woven polyester. The triple action filters promote free airflow, and have superior dust holding capacity. Particulates are captured and attracted together electrostatically to form larger clumps. These settled particles are washed out through drain holes during periodic cleaning. High performance power supply is field replaceable with no tools and has been tested and certified to MIL-STD-461. Wouldn’t it be nice to have a triple screen laptop? In the past, laptop display electronics could barely keep up with the display resolutions however, today’s high-end laptops have powerful graphics accelerators that allow laptops to become graphics powerhouses. It’s great to have so much power in a portable package, but many jobs require more displays and larger displays than can be found on commercial laptops. 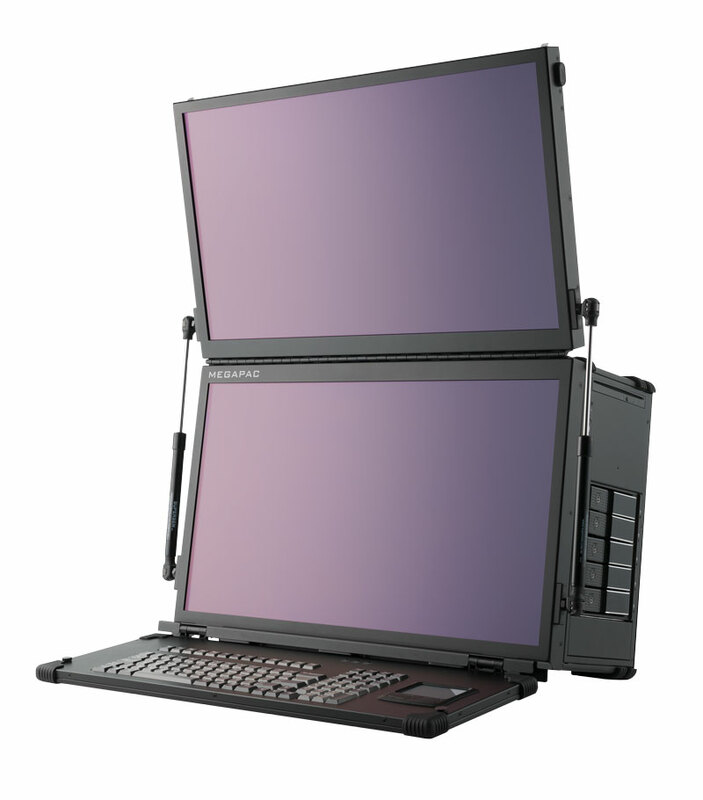 Enter a possible game changer for the traveling professional that needs multiple big displays on a laptop. The display is laptop agnostic and will work with most laptop PCs & MacBooks running Windows O/S, Mac O/S or Linux. The laptop has to have enough sources of video output to drive the three displays or some extra USB-3 or USB-C ports that can drive a conversion cable available from the manufacturer. These work transparently to the user, and work really well. When opened for use, there is more than 5 feet of horizontal display area and the outboard panels can tilt inward to provide the best viewing experience for the user. 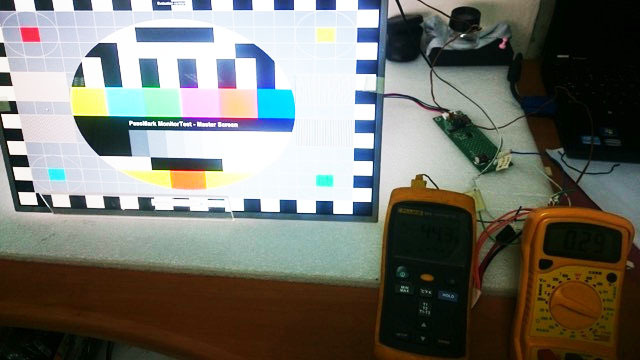 Each display has it’s own adjustments for brightness, contrast and color temperature to allow for exact matching of the three displays presentation. When folded the display gets quite compact (for a triple screen 24” system) and will fit under an airline seat or in the overhead compartment. Overall dimensions closed are: 23”W x 16”D x 5”H. Weight is about 15lb. If there is space on your desktop you can also leave the laptop open to one side and go from a triple screen laptop to a quad screen laptop! A folding carry handle mounted to the top of the unit for single-handed transport. It has a rubber molding to conform to most hand sizes. 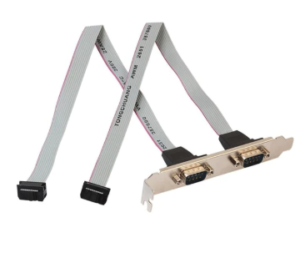 The individual display data cables are routed through a unique hinge that serves to both pivot the display, provide friction resistance for accurate positioning and to protect the cables against chafing or wear. 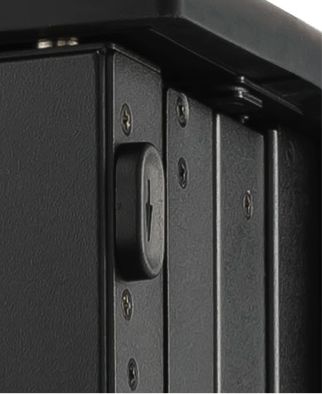 The triple 24” displays are locked together by spring-loaded latches. 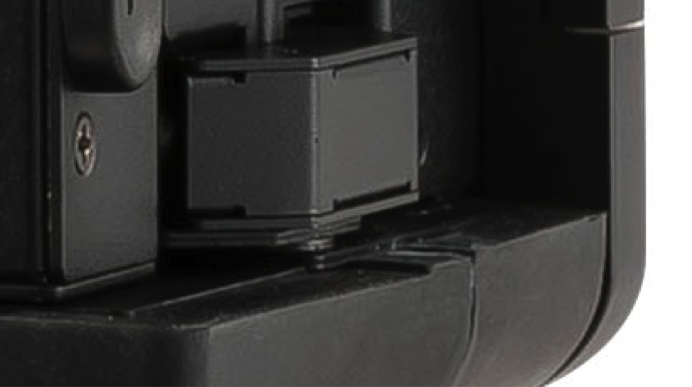 Both latches must be released to unlock the displays providing protection for accidental opening. 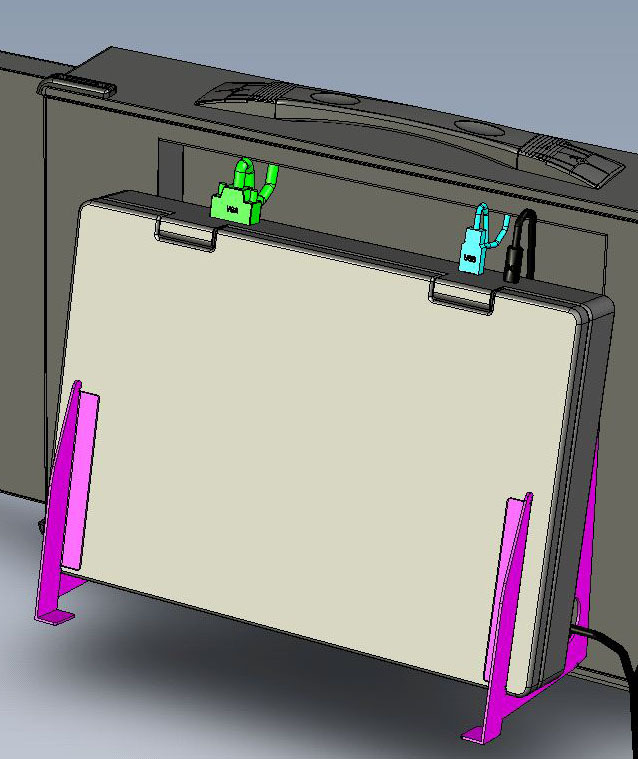 An optional laptop mounting bracket is available that provides a mounting location for the user’s laptop and laptop power adapter behind the triple display system. It attaches to the rear of the main chassis and has adjustments to accommodate a variety of laptop sizes and thicknesses. Pricing: MSRP is $3495 with delivery of 6-weeks ARO. Workstation users are getting younger! The callow youth that operate our C4ISR systems were brought up with a touch screen tablet in their cradles. 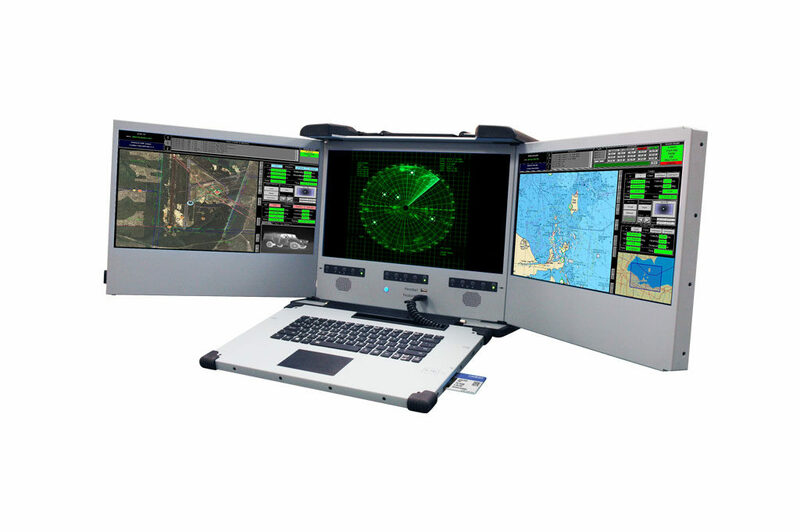 To make the best transportable workstation even more appealing to the actual users, AGS has added multi-touch controllers and three touch screens to the MilPAC-III. 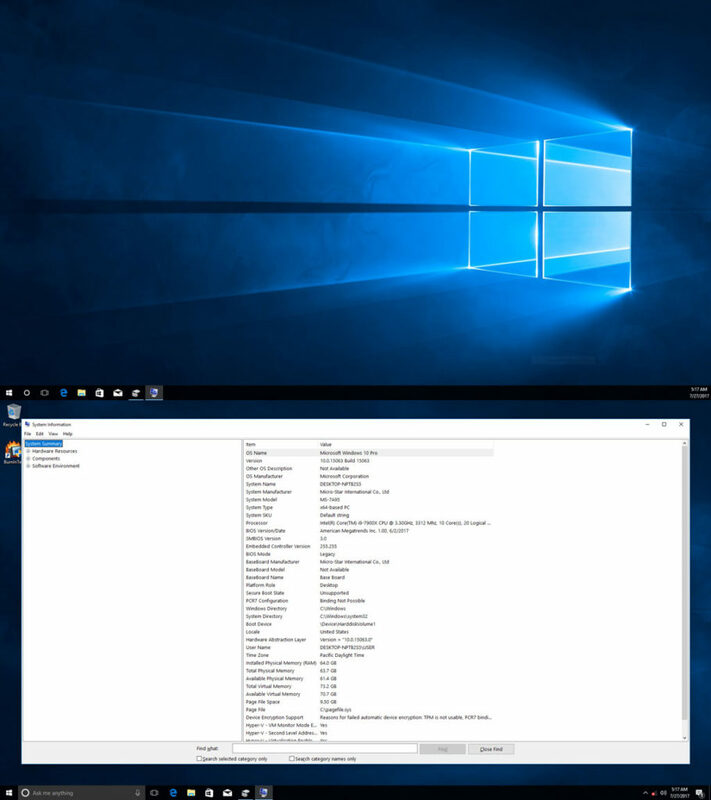 Rotating, panning and zooming are now much more natural movements, and navigating across the entire 5760 x 1080 image space no longer requires multiple trackpad slides, or repetitive mouse movements. Multi-touch controllers can respond to up to ten inputs per display. The robust friction hinges of the MilPAC-III work perfectly with touch operation, and may be angled to give the operator the ideal viewing angle and touch experience. The MilPAC-III has dual 22-core Xeon processors and can be fitted with up to 40TB of SSD storage for extremely fast and highly reliable storage. Operating with large datasets and GEOINT overlays is smooth and responsive. 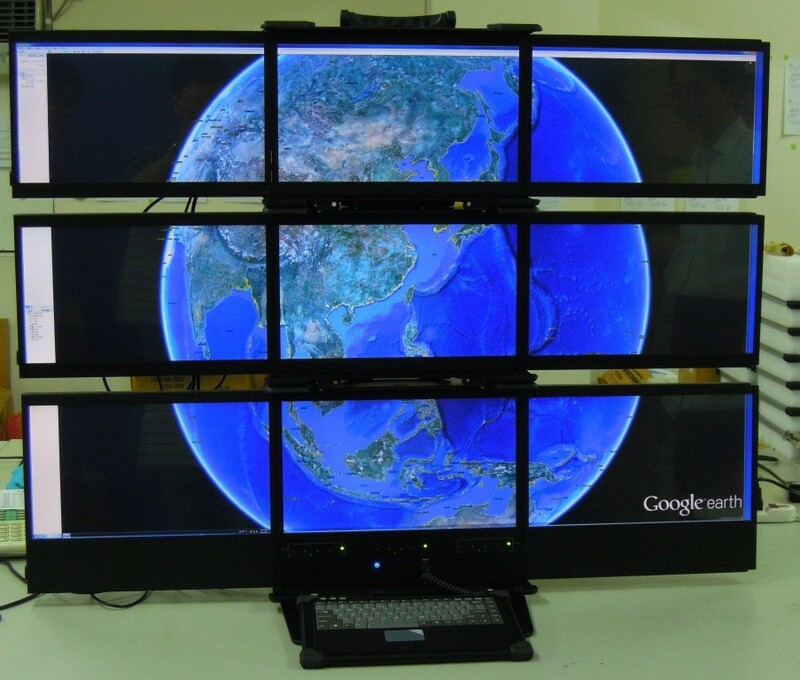 Each display can be mirrored to an external TV or other monitor when sharing data with senior staff is appropriate. The MilPAC-III passes multiple mil-specs including Mil Std 901D Lightweight shock, Class B and MIL-STD-810F. It is deployed and proven in theater Worldwide and is available from AGS in Azusa CA. 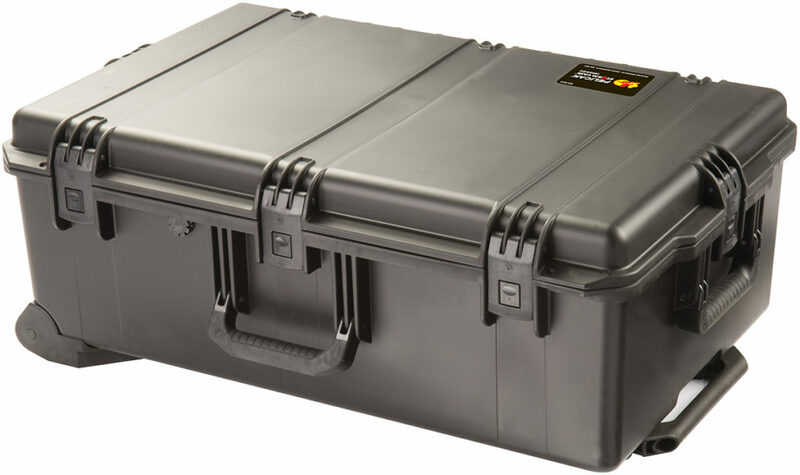 The MilBOX is intended for users who need a fully rugged mobile server that can withstand shock, vibration, humidity and temperature to Mil-STD 810F requirements. Sometimes, you just need a computer that will survive being mounted almost anywhere, but still needs to be connected to whatever your are controlling/monitoring/logging. Such computers are sometime known as brick computers, shoe-box computers or if you are being polite, “small form-factor computers” because they are not very imaginatively designed! Most of the engineering issues are of heat management and making the I/O fully waterproof. Brick computers are usually fully sealed enclosures, so forced air cooling can’t be used. In fact in the MilBOX there are no fans of any kind. Cooling is through conduction and convection, with the casework operating as a heatsink. 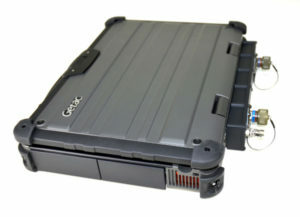 The MilBOX is a COTS display-less computer in a metal enclosure with multiple mil-spec connectors mounted to the front panel. Interfaces include options got GPS and Wireless cellular access, as well as the usual USB (4 x 3.0), dual Gigabit LAN, 2x SATA3 (6Gbps) ports + 2x SATA2 (3Gbps) ports and dedicated Isolated DIO, 8in/8out. These sorts of computers are often underpowered when it comes to processor performance – but the MilBOX has an Intel® Core™ i7-3610QE which is a Quad Core CPU (with Hyperthreading to 8 virtual cores) with 6 MB SmartCache and Intel® HD Graphics 4000 on chip. It operates at 2.3GHz (3.3 GHz Turbo) and dissipates only 45W (TDP). For the kinds of environments you might encounter, the operating temperature range is -25°C ~ +70°C (Start up can be a low as -40°C) A special wide temperature-range SSD is integrated. 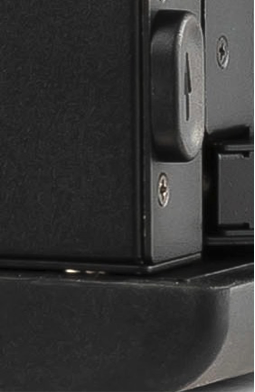 Weighing 10.5lb with the Mil-Connectors, the MilBOX is IP65 rated and has AC & DC (10-36V) inputs. 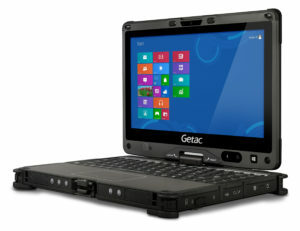 The Getac V110 is a modern, well executed rugged notebook which can be converted to tablet format. 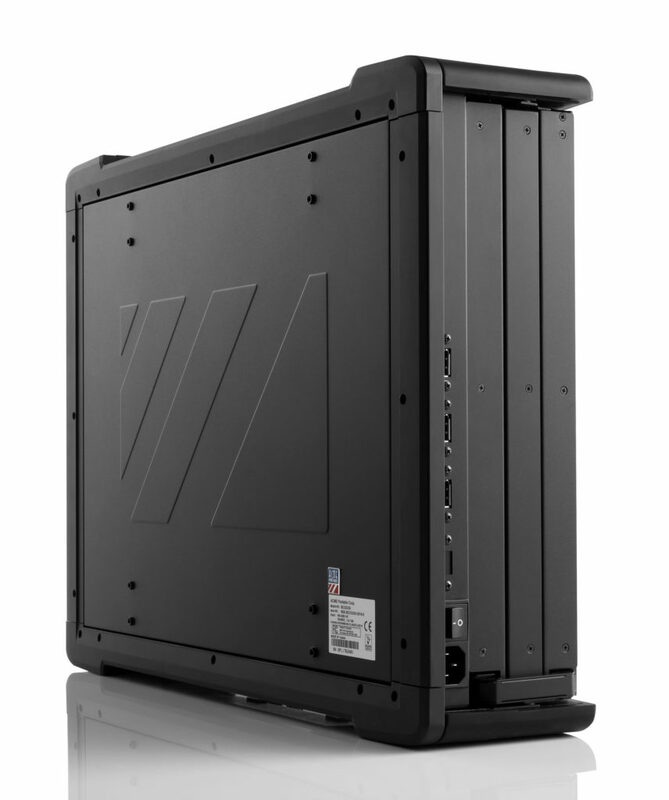 Like almost all commercial rugged computers, the V110 is pretty robust and well sealed – until you want to connect it to something. In the commercial world wireless and battery power may be acceptable, but military applications often require radio silence, and extended operation. 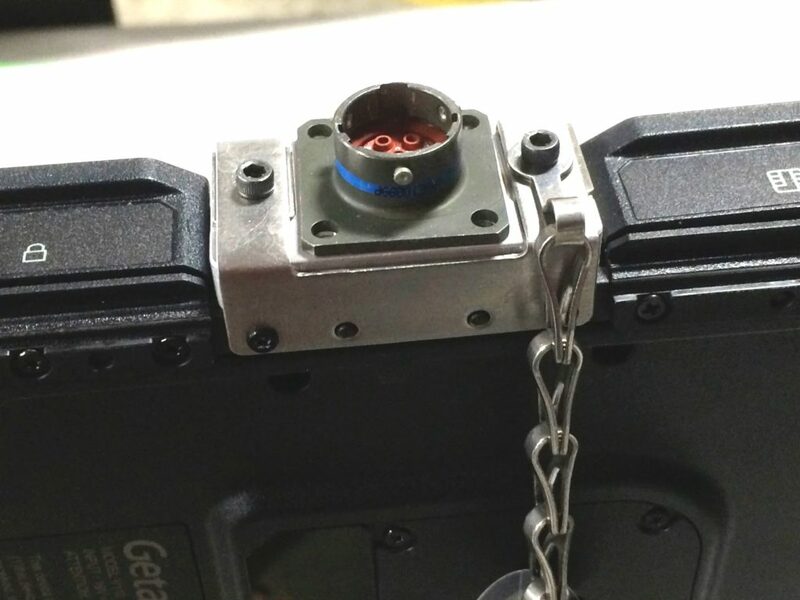 Replacing one or more of the commercial connectors with a small format Mil-Spec connector can solve this issue. Small and light, the side V110 MILBOX is a CNC machined housing that installs on the side of the notebook in place of the USB3 port and audio ports. 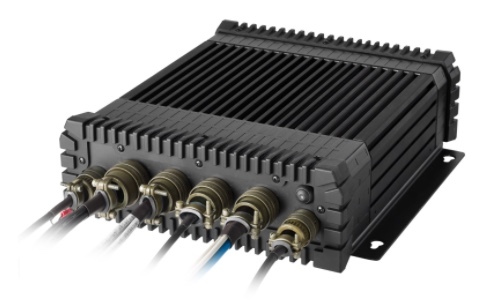 The side MILBOX allows the user to interface to Power and USB or Ethernet signals via a single rugged MILSPEC connector. Other connectivity is possible – USB3 can be converted into many useful protocols / interfaces. The challenge is to find space inside the V110 to perform the conversion. As standard this modification includes power (DC in) and USB or Ethernet.